This is a good news. The pilgrimage to famous Sikh shrine, Hemkund Sahib in Uttarakhand in Himalayan India, suspended since the June 16 natural calamity, resumed on Saturday with Chief Minister Vijay Bahuguna flagging off a batch of nearly 100 pilgrims from Govindghat. The flag-off took place after “bhog” and a ceremonial recitation of Akhand Path. The portals of the shrine located at a height of 15,200 ft will reopen on Sunday when the first batch of pilgrims arrives there. Now the pilgrims and trekkers alike will be able to make most of whatever season is left to go to Hemkund and world Heritage site of Valley of Flowers. Though damage to the shrine devoted to the tenth Sikh Guru, Guru Gobind Singh was not as extensive as in Kedarnatah, a 6 km stretch of the trek route to the high altitude Gurudwara was washed away in the June 16 deluge. The route to Ghangriya from Govindghat was also ravaged in the floods. 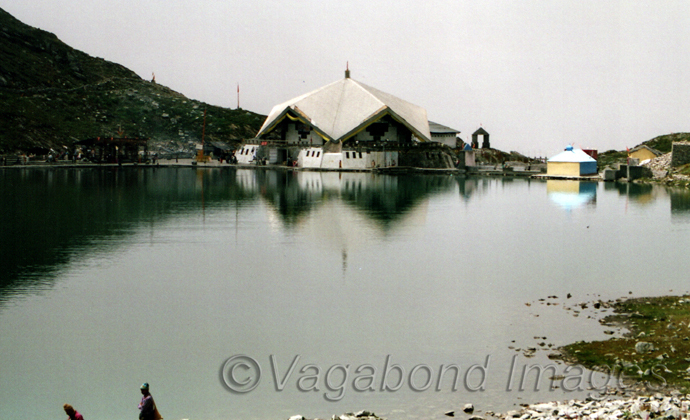 Ghangria works as a base camp for trek to Hemkund Sahib as well as Valley of Flowers. With the damaged pedestrian route completely repaired, thanks to massive restoration efforts put in by Hemkund Sahib Management Trust, the yatra was ceremonially resumed on Saturday. However, as a precautionary measure, the number of pilgrims to the shrine will be kept limited to about a 100 initially which will gradually be increased in the course of time. Resumption of the yatra to the Sikh shrine is yet another indication of things gradually getting back on track in rain-ravaged Uttarakhand. Prayers at Kedarnath, which bore the brunt of the June calamity, resumed on September 11.